So I've posted about The Truth Movement Australia before. The founder, Adam Davis, has been travelling around Australia and visiting with folks who have signed up to the website. Tonight was the Melbourne edition, and the turnout was fantastic. Possibly 60-70 folks rocked up to the Glitch Bar & Cinema, a place I never knew existed. It's a small, community cinema that runs Spiritual Cinema, which shows a film that will expand your mind every 1st and 3rd Wednesday of the month. Incredible. I've attached the flyer above for the next fortnight, something I think I will attend, as I'm very curious about The Venus Project. 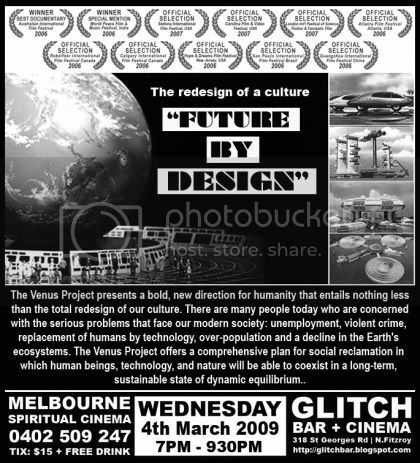 For all folks who want to see what's really going on in our world, see past the deceptions, the flaws in our society and how we can come together to fix it, both The Truth Movement Australia and The Venus Project, along with the Spiritual Cinema, are a great place to start. Hit me up for more info.